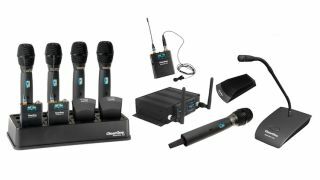 ClearOne’s recently shipping, small-form-factor DIALOG 20 wireless microphone system now features native compatibility with the ClearOne CONVERGE Pro 2 line of mixers, offering integrators increased flexibility and ease in system design. This new native integration feature utilizes ClearOne’s new P-Link (peripheral link), which allows for PoE (power over Ethernet), audio, and control connections with ClearOne’s CONVERGE Pro 2 DSP mixers. ClearOne’s P-Link allows integrators to connect to ClearOne’s peripheral devices such as the Beamforming Mic Array 2, DIALOG 20 Wireless Mic Receiver, USB Expander, and GPIO Expander. The DIALOG 20 is a compact, two-channel professional digital wireless system with flexible powering and mounting options, plug-and-play installation, and the ability to connect digitally to ClearOne CONVERGE Pro 2 DSP mixers. It also has standard audio and GPIO interfaces for any third-party audio mixer. It delivers full audio bandwidth through gooseneck, boundary, belt-pack, or handheld transmitters and can connect to any type of audio conferencing or reinforcement system. Leveraging the full power of ClearOne's robust, adaptive frequency-hopping "spread" spectrum technology within the 2.4GHz unlicensed spectrum, DIALOG 20 offers several advantages over fixed-frequency transmission. Its design is inherently resistant to narrowband interference because it uses a pseudo-random sequence to switch frequency; this makes frequency-hopping signals extremely tough to intercept. The use of 128-bit AES encryption on each hopped frequency further secures the wireless audio transmission. The ability to natively integrate with CONVERGE Pro 2 mixers makes the DIALOG 20 a versatile two-channel wireless microphone system capable of meeting a variety specific user requirements. All current owners of the ClearOne DIALOG 20 wireless system will be able to upgrade and obtain native integration through a software update.